Elder William Perkins is the co-director of the Recording & Sound Reinforcement Ministry. Ordained and installed as an Elder by Dr. C. Ronald S. Williams in 2011, Elder Perkins fulfills the call of God with the full responsibilities of a minister of the Gospel of Jesus Christ. In his role of supporting the vision of Dr. Williams, Elder Perkins has served as editor and producer of the “Straight Out of Zion” television and radio programs as well as the church’s DVD and audio media. Elder Perkins is currently pursuing a Bachelor of Biblical Studies degree from Indiana Wesleyan University and is a recipient of the 2013 “Who’s Who Among Students in American Colleges & Universities” award. 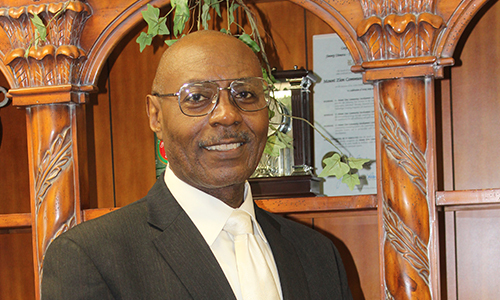 Elder Perkins served as instructor for the Ohio Christian Education Association conference and in outreach ministry at the Cleveland Justice Center. As a member for over 18 years with his wife of 32 years, Deaconess Tanga, Elder Perkins is committed to the success of ministry through integration of personal and corporate worship as taught by the Senior Pastor, Dr. Williams.